Hailed as a “music guru” by Rolling Stone and called "the most creative mixtape producer of all-time” by music icon Questlove, J.PERIOD is a musical storyteller whose work connects cultures, eras and styles. J.PERIOD's resume boasts collaborations with GRAMMY® winners The Roots, Nas, Kanye West, Q-Tip, Common, Mary J. Blige, John Legend and Pulitzer Prize-winning Playwright Lin-Manuel Miranda on the Billboard #1 album, The Hamilton Mixtape. His extensive roster of collaborators, combined with a visionary approach to musical storytelling, has earned comparisons to both DJ Khaled and Ken Burns. In 2018, J.PERIOD also earned a prestigious appointment to the inaugural Kennedy Center Hip Hop Culture Council. 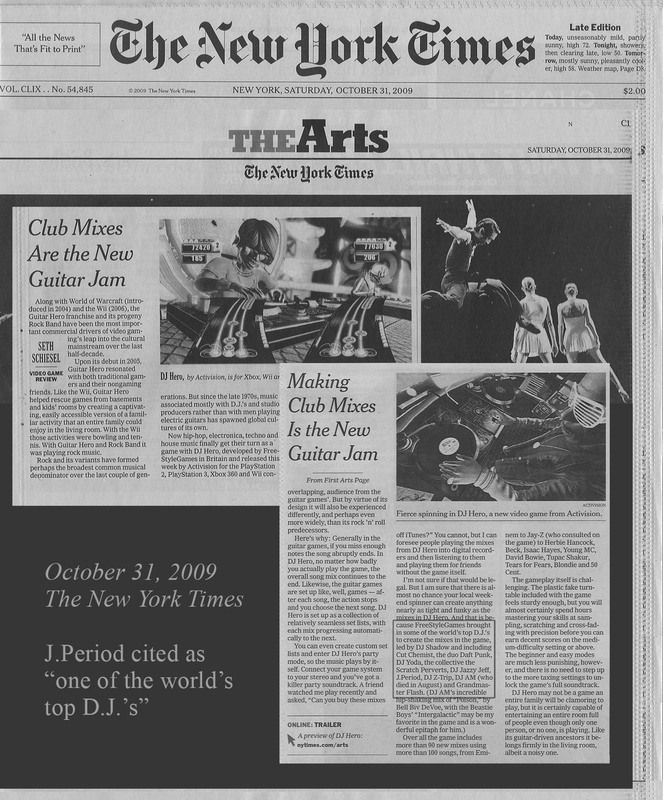 “Make no mistake,” says DJ Booth, “as to the power of J.PERIOD’s impact and influence on hip hop culture." As a producer and composer, J.PERIOD's work has been featured in EMMY®-winning films (The Doctor), flagship series (America Divided, NBA Inside Stuff), and blockbuster film trailers (Universal Pictures' American Gangster, Fox Searchlight's Street Kings, Paramount Pictures' Terminator: Gynesis). 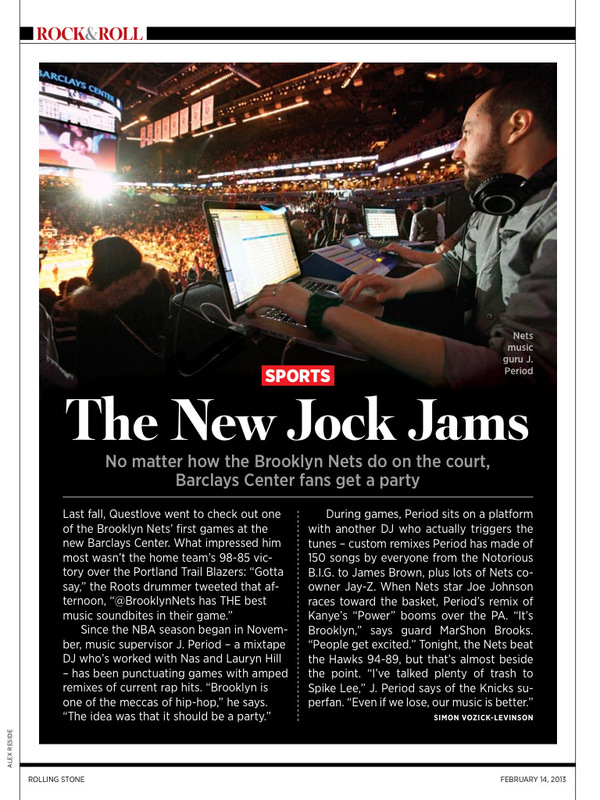 As Music Supervisor for the Brooklyn Nets at Barclays Center, J.PERIOD's custom-curated soundtrack won rave reviews as the new standard for music in the NBA arena (ESPN). J.PERIOD also produced the Nets' opening theme song for their first two seasons in Brooklyn. In 2018, J.PERIOD's groundbreaking performance series, The Live Mixtape (a star-studded Hip Hop mixtape recorded live onstage in one take, and now available on all streaming services) headlined at Sony Hall NYC, The Kennedy Center, Brooklyn Academy of Music, and was featured at The Roots Picnic. Other notable performances include: Smithsonian NMAAHC, SXSW, and "Art of The Crossfade" at Ted Talks. J.PERIOD has also performed as Official Tour DJ for artists including Black Thought, The Roots, Lauryn Hill, and Q-Tip. To hear past J.PERIOD productions, click here. Working with J.PERIOD guarantees a musical journey and an astounding educational experience. Listeners are sure to be transported to a space that makes you know how essential music is to the world. J.PERIOD has played an integral part in reinventing how we musically entertain our fans. He has strong ties to Brooklyn and the diversity it represents. We are fortunate to have him as a part of our team. One of the world's top DJs. J.PERIOD mixtapes are like aural documentaries... and the roster of artists he's worked with is truly staggering.